Leeds had to score the latest goal in the club’s history to rescue a point on Saturday, and going into Wednesday’s clash against Swansea there is one major change required in the centre of the park. Unsurprisingly, Leeds dominated the ball at the Riverside Stadium on Saturday, racking up 69 per cent of the possession. The hosts took the lead through Lewis Wing though, and it wasn’t until the 101st minute that Leeds equalised, with Kalvin Phillips glancing in from close range after a header by Liam Cooper. 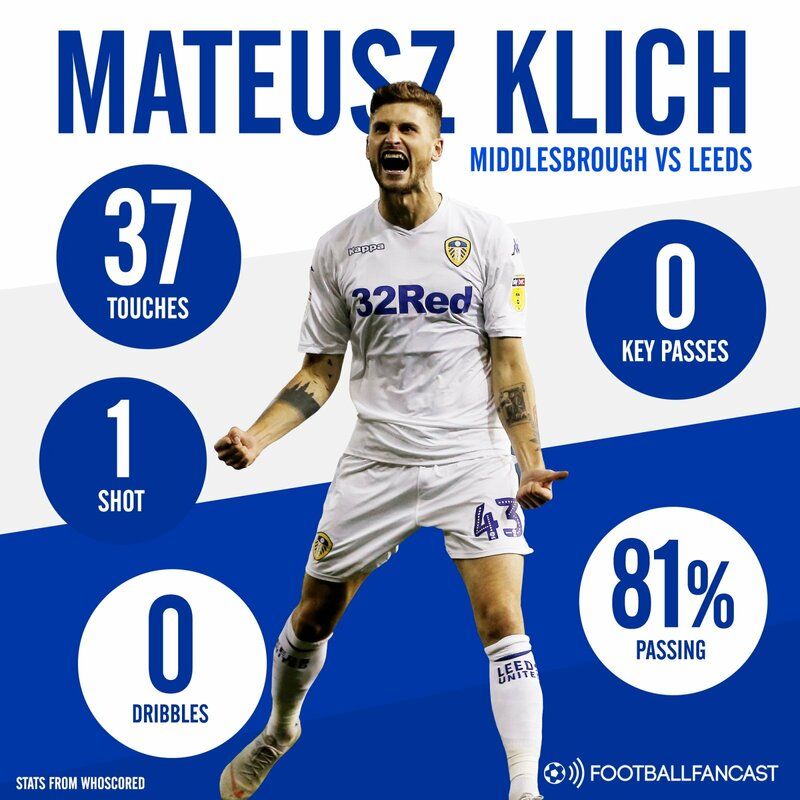 Despite the scenes in stoppage time, it will be hugely concerning to Marcelo Bielsa that his side produced just four shots on target for all their control of the game, and it may be time for Mateusz Klich to get a rest. The Polish international was nothing short of sensational in the first half of the season. After being cast out on loan in the last campaign, he grabbed five goals and five assists by the beginning of November to kick off his 2018-19 season with a bang and become an instant Elland Road favourite. Since then though, the popular midfielder has scored just twice – a brace at Rotherham – and also provided one assist. He was ineffectual in the match against Middlesbrough, touching the ball just 37 times, the third-least of any Leeds starter, and registering just one shot, which didn’t hit the target. Klich is in the team to create and score goals, so failing to muster a single shot on target, successful dribble or key pass is a major concern. Put simply, the 28 year-old appears to be running out of gas having racked up nearly 3,000 minutes of football already this season. It is perhaps unsurprising then that the Whites’ attacking production has fallen off since the turn of the year, as their best attacking midfielder is not performing to the level he was before. Bielsa’s side welcome a Swansea side to Elland Road on Wednesday night that haven’t kept an away clean sheet in the league since November, but Klich should watch this one from the side-lines.